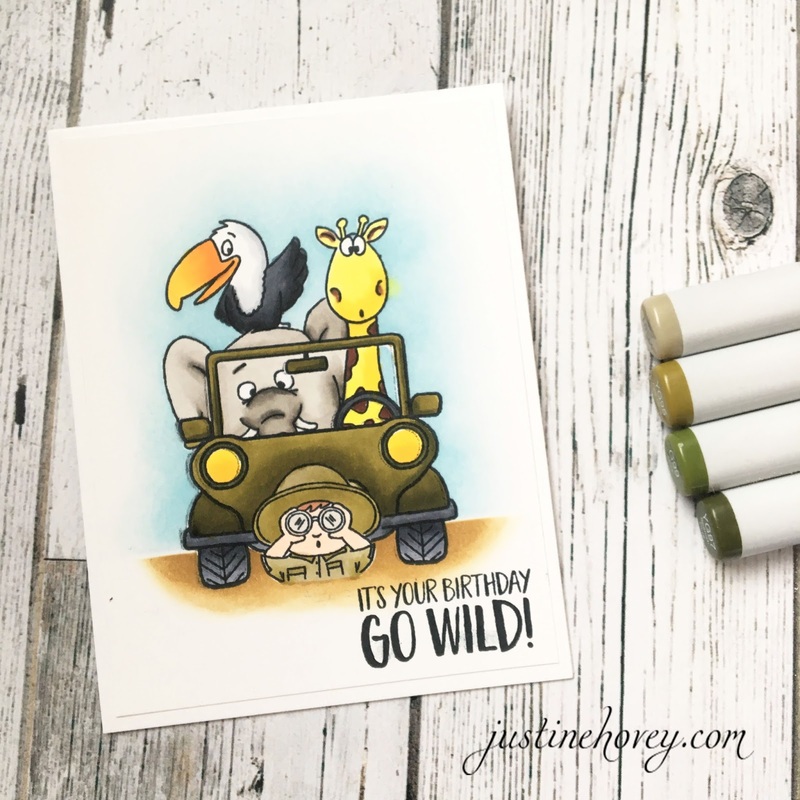 Justine's Cardmaking: Gerda Steiner Designs Go Wild Birthday + Stamp Giveaway! Gerda Steiner Designs Go Wild Birthday + Stamp Giveaway! I'm back guest designing for Gerda Steiner Designs. I just love these critters! They are too adorable and I had this funny image in my head of the animals car-jacking the safari vehicle and leaving the guide behind so this is what I created with my Copics and the Go Wild Stamp Set. I'm am also giving away a Go Wild Stamp away on my Blog! I love love love this card! It's so cute and a great birthday card for wild kids! Great scene!! Very creative and fun! I love to mask , I'm just now getting into that. I love animals so this is a great cards. Love this card!! Thank you for explaining the masking paper. Off to make a purchase!! I love how this turned out! Your copic coloring is great! You don't give yourself enough credit! So cute! I love Gerda Steiner stamps. I need to really play with them more often. Your safari card is such fun and talk about impressive masking! Love this! My niece and nephew would "go wild" if a card like this appeared in their mailbox! How clever and cute! Masking is such an awesome technique. I haven't tried masking yet but this makes me really want to. Love this card! So creative! What a fun stamp set! OMG Justine Your Card is So stinkin ca-ute and extremely Funtabulous!! Great Coloring job and loved all the techniques you shared to achieve your look which by the way is Spectacular. Thanks for a chance for a Fab Giveaway!! How adorable is that! Way to use all the stamps in the set. Love the fun card and the great stamp and wonderful colors.Smiling from ear to ear. This is SO CUTE, especially for kids! Your coloring is awesome!! Such a fun card, awesome! Love your creative mind and card!! Such adorable images! This card is so cute! GSD stamps r all so adorable, it's hard to decide on which ones to get. They're all must haves! Thanks for another great video. LOVE,love,love this stamp set and your card is ADORABLE!! !I haven't tried masking yet, but would like to give it a go and this card is perfect for that. tfs very inspiring. I love the card and think it turned out super cute. But you link to your facebook is broken. Very fun card! I love that cute giraffe! A darling card! Love those adorable animals & your awesome design! The design on your card is so fun and the stamp set is perfect for building scenes. Such fun! Loving the animals! Love the scene you made with these super cute safari critters! WOW! Really cute card. You did an awesome job on the coloring. Omg!!! Justine.....love love love this card that stamp set....adorable!!! Love Gerta Steiner stamps as well as So Suzy Stamps. You showcase both well. Ridiculously cute card! Love these stamps. cute card! love how you have them stacked in the vehicle and your coloring! This card is absolutely adorable! Love the sweet critters! TFS! Such a cute card, where can we get this stamp set? It is so stinkin cute! I love the technique, I am definitely going to give this a try. I enjoy watching you color and this set is adorable! That is such a cute card!! So fun!! You are so creative with your making, I'm loving it! I love the scene you created! So fun, with those cute animals in the car! Really nice card! I love the scene you created on this card. Awww!!! Such a funny and adorable card!!! Gerda Steiner's critter stamps are absolutely cute!!! Love your card, Justine! All of the critters are so cute. Your coloring is great. I think I'm going to have to order the Go Wild stamp set. I think the bird is my favorite. BTW, it's a Jeep I believe. At least that's what it looks like to me. :-). Thanks for sharing! I've been noticing the Gerda Steiner stamps a lot recently...adorable! Cute safari card, it's absolutely adorable. How absolutely adorable!! Love this scene you created!! So cute!! I hope you do a video on it. There's a video in the post. LOVE your fun card and great video!!! Darling card. My grandson's birthday is coming up and he would adore a card like this. Thanks for the inspiration. This card is adorable! Thanks k you for showing the masking technique. What cute characters these wild beauties are. Love your gorgeous card. Justine, this is just way too stinkin' CUTE! I love Gerda Steiner's stamps and this set is one of the cutest! A great job! For someone who claims they aren't good at copic coloring, you sure know how to make it seem like you do! I think it looks fabulous! I love this card. I cannot believe you think you are not good at copic coloring. Hmmph! I think your card is adorable. I love that you are so enthusiastic and you taught us a bit about masking as well. I need to try my hand at this skill soon! You are good at everything it seems. This card and stamp set is absolutely adorable. Thanks for sharing. Very cute, love the critters. This card is adorable: I love how you arranged all the characters. Beautiful scene as well! Your card is adorable and fun. What an adorable stamp set and scene you created! Oh, this car jacking scene is priceless! Love this cute card! And now I think I need to try masking.....adding that to my list! Love the GSD stamps. And love this card. Such a cute card, and what a darling stamp set! I love this masking card technique and would love to try my hands...thanks! I love how simple and adorable this card it! What a fun card! Definitely wild! Love it! Love this card. The animals are so cute they just make me smile. Love your card! These stamps are too cute! Fabulous card and this stampset is simply adorable! This card is so darn cute! This stamp set is adorable!! This is so cute! I usually avoid masking, but your card sure makes it look worthwhile! That stamp is so darn cute! I have been looking for a zoo themed stamp set, this is great! what a cute card! I love that stamp set. Really fun and cute images from GSD! Love the card. So cute! Love the adorable card you created! I'm not so good at masking but you inspired me to give it another try.